Klein Beginnen - Kids fashion in Rotterdam. In this roomy well displayed shop one can find modern expecting mothers clothes, great baby clothes, sporty children’s prams, accessories, care articles, special toys and ever changing gift articles. At Klein Beginnen a very special collection of beautiful, top quality clothes have been selected and beautifully displayed. The assortment changes regularly, and because of this the shop keeps up with the latest trends, and the classic clothes are also well represented. It is not for nothing that this shop gets the name of being one of the loveliest children’s shops in Rotterdam. 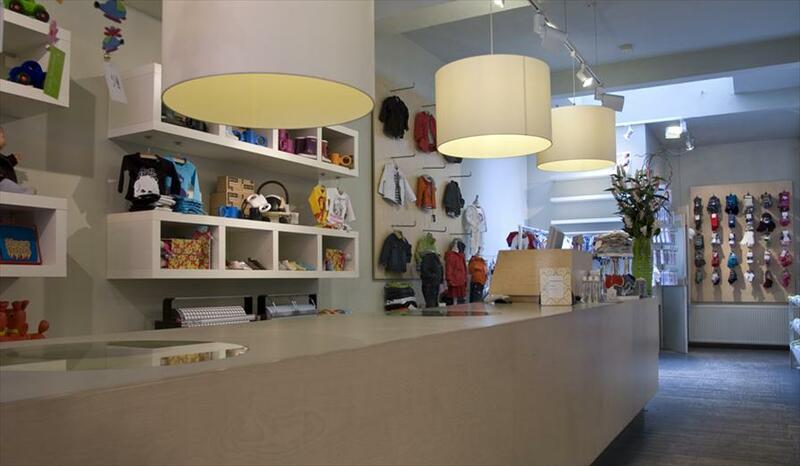 The shop is modern and hip and the atmosphere is very friendly and one can look around at ones leisure. Noppies, Vida Vita, Queen Mum, Fragile, Mamalicious (maternity clothing) Imps & Elfs, Noppies, Kik Kid, Kids Case, No-No, Z8, Petit Bateau, Koeka, Claesens etc (baby clothing) Bugaboo & Bugaboo Bee, Stokke, Phil & Teds Explorer, (prams) Baby Bjorn, Lodger.